What I tried was embedding fonts into my Powerpoint files when saving them. Maybe you have known you could do this all along but I had no idea!!! I love PPT but I am always blown away when I read/watch a tutorial by other bloggers about the features I had no idea about. I have loved the tutorials by Kristen at Ladybug Teacher Files and Ashley of The School Supply Addict and Jivey at Ideas by Jivey and Holly! So I thought I would pass on this little tip just in case, like me, you were unaware. 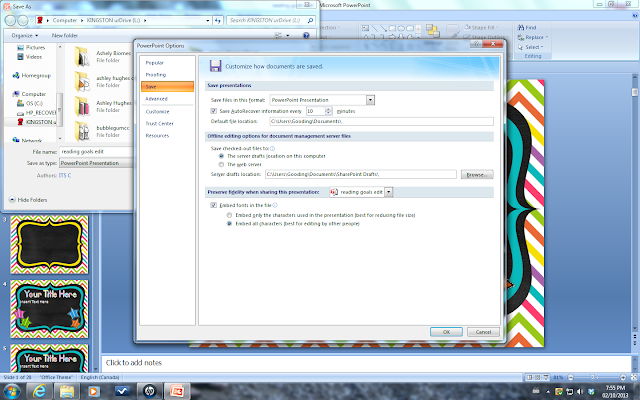 And insto presto you can work on or edit your files on any computer even if it does not have the same fonts!!! I can't tell you how many times I have started a file at home only to get to school and need to make a small change only if I do that it will not be in my pretty little font. Or I create an actual powerpoint to show my class/school and save all the files as jpg files to reinsert so as not to lose my fonts. Aaahhh!! 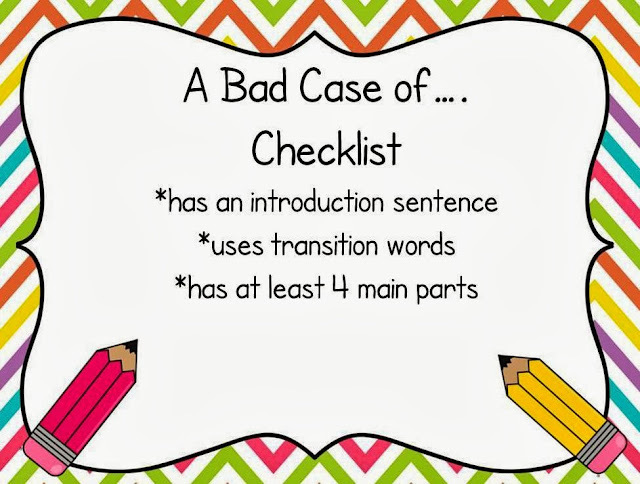 Sorry if this post made you go, uh duh everyone knows that, but I did not and I am so glad I tried it because I have some making connections pages that I would love to be able to modify for some of my students and personalize to the books we read. 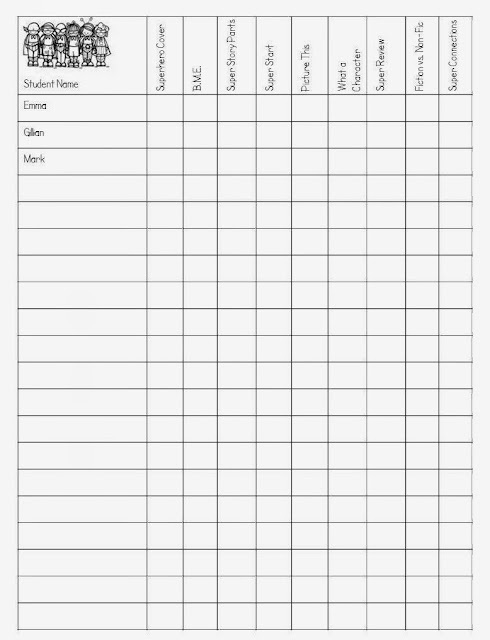 Also I created my reading and writing goals and home reading files to be editable - only I was editing at home - now I can edit at school while planning and get my goal pages etc. ready - woo hoo!! 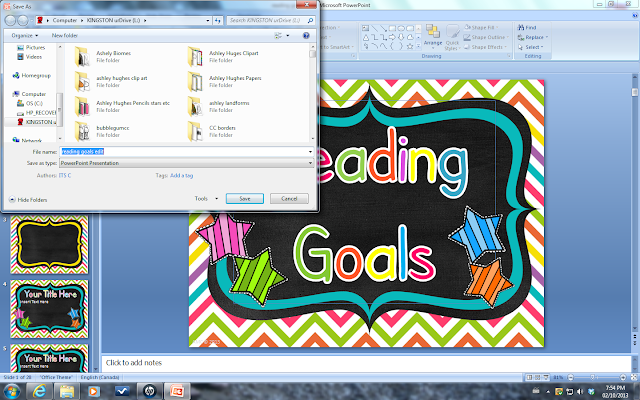 Here I am making a writing goal page to match the lesson more specifically...at school. Not at home!! Before I knew this trick I would have an idea at school, add it to my to do list and hopefully get it done at night. 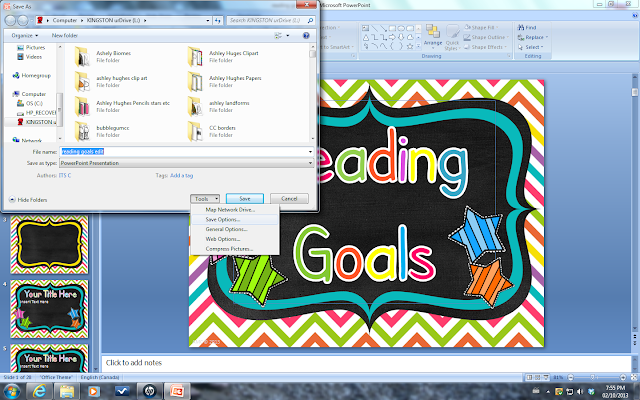 Now I can edit my files with the right font at recess or lunch or on my planning time and print at school!!! I can update a class list for my home reading program. Again I apologize if you have always known this but if I can help just one fellow teacher who misses their cute fonts when trying to edit a document at school then this post has been worth it! 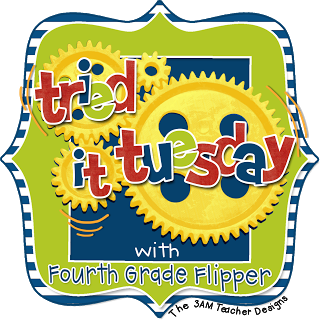 Be sure to check all the other great ideas that were shared on Holly's blog. Thank you! I did not know this either. I have sent some items that I have worked on to team members, and the font got completely messed up. I thought I couldn't use any fonts from another source. Now I know I can keep using my favorite fonts. Wow! I did not know this. I'm so glad I clicked your post to read! What a great trick to know. I make a lot of my things on my laptop but then have trouble printing and/or editing them at school because of the fonts. I did not know this either! Thank you for sharing. I am going to have to play around with it this weekend! I didn't know this either. I'm so excited. I'm twerkin' around my living room with happiness. I'm kidding...LOL! Thank you SO much for sharing! Going to go test this out now! I didn't know this trick either. I always make my final copies into PDFs so i can print from school without messing everything up. This is way easier! This is totally news to me! Thank you so much for sharing that! That is awesome! I totally did not know this either. This will make it so much easier for me to work on things I started at home at work. I am excited now. Um so you've totally made my day!! I do the school year book at my school and I find it SOOOOOOOOO incredibly annoying having to take my laptop with me to the computer suite, just so that I can use the fonts on it! Especially as my laptop doesn't like printing!!! Thanks sooooo much for this tutorial! You've saved me time. Um, thank you!! I did not even know this was possible but I am so excited about it!!! I hate lugging my laptop to school just to use my fonts! Best post of the week!! I didn't know either. Thank you! This makes school prep time even more productive! I know what you mean when you say, "Sorry if you already knew this..." because I am always thinking that when I write posts. Everyone already knows this...haha! Obviously that is not the case! Thank you so much!! One of my students looked up at me with frustration the other day and said, "I don't know what I don't know because I didn't know I could even know that." That about sums it up for me. I didn't know that you could do that! This old dog learned a new trick! Thanks for sharing. Wow, that was great, thanks! Oh my goodness!!! You just saved me so much trouble!!! Great tip :) Thank you so much. Wait...you can do WHAT???! This post has just changed my life. Thank you SO much! Holy moly my friend! I had no idea about this! This is AWESOME!! I'm so glad you shared it! I love you for it. Ok, so I loved you anyway...but I love you more now!!! I had no clue! Now I can stop emailing fonts to my work computer. Yay! I also did NOT know this could be done!! Thanks for sharing!! OMG!! This is awesome! I just forwarded the information to my daughter, too. She's a first year teacher. You are the best!